MARK BRIGGS PHOENIX ATTORNEY: DO I NEED AN EXIT STRATEGY FOR MY STARTUP? You can’t just walk away from a business. You must take care of all financial, tax and legal obligations. If you plan to seek investors, they’ll want to know your exit strategy. Why? Because that’s when they hope to get their money backplus a profit. 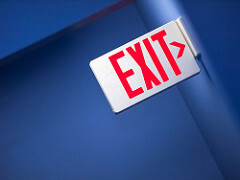 In its simplest form, an exit strategy is a plan for “cashing out” of your business, whether selling to a strategic buyer like a competitor, selling to a financial buyer like a private equity group or hedge fund, selling to a group of your key employees, selling some of the company’s stock on the open market (commonly referred to as an “IPO” or initial public offering), or merely liquidating the company’s assets in a strategic manner. Your company’s exit strategy will be based on many factors, including your personal financial goals, as well as your investors’ expectations. You will need to decide the right timing, financial benchmarks and other factors that will be your guide to when and how to execute your exit strategy. If you don’t plan to sell the company or seek investors, an exit strategy can be more focused on contingencies such as what happens if you or your partners become disabled, die, divorced or just want out of the business. DOES MY BUSINESS NEED AN EXIT STRATEGY? Forced exit – Simply stated, this happens when the cost of doing business outweighs the revenue it generates. The recession that affected many Arizona-based real estate companies in 2007 through 2009 forced many companies to close their doors suddenly. Forced exits can also happen when an owner dies, severe weather or a fire destroys a key facility, or the main product of the business is rendered obsolete by technological advancements. Many forced exits end in bankruptcy filing. Strategic exit – When a startup company begins with the intention of growing to a certain size and then selling the business or taking it public via an IPO, its founders have planned a strategic exit. They set benchmarks using metrics such as gross revenue or net profits, number of customers, percentage of market share, time in operation, number of locations, or valuation of the enterprise. Circumstantial exit – Though it might not have planned to do so, a company might execute an exit when a deal too good to pass up comes along, or a key principal in the business experiences an unexpected major life event like a serious health problem or a divorce. How long do you want to run your business? Do you want to transfer the ownership of your business to your family or key employees? If your or your partners die, get divorced or are incapacitated, what happens to their shares of the business? What are the metrics that will trigger the sale of the business? At what purchase price would you to sell the business during this coming year? Who will be in charge of running the exit process when it occurs? How will you handle public relations of your business’s sale or closure? How and when will debts, if any, be paid? Your attorney will help you define your exit strategy, and you should revisit it at least once a year to make sure the changes in your business are reflected in your business plan and any agreements you have with other owners.